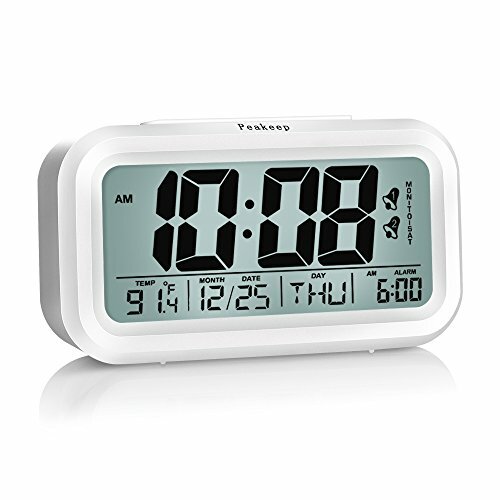 Large display alarm clock with bold 1 1/2" numbers. Convertible ℉ & ℃, 12HR & 24HR with simple operation. Compact size, enough to be practical at home as a desk clock, shelf clock and home clocks. Whole size of a palm and it battery powered, it can be stashed in bag when travel, and that the sensor light gives off soft light makes you find it out easily. Dual alarms for two separate awake time. When alarm is activated, the clock sounds beep for 60 seconds in a crescendo and will be reactivated 8 minutes later. It can be optional from MON-FRI, MON-SAT, MON-SUN. Alarm will be automatically off at weekend, makes you enjoy your holiday, no to be late for school/work/party in business days. Turn on the senor, when you turn your light off at night, you can see what time it is and doesn't make the room so dark. If you think the light is a bit bright, you may also turn off the sensor, the screen is lighting only when you press "SNOOZE/LIGHT" button at the top. Large Bold Numbers Digital Clock--5" unit with 4 3/4" screen, nice large digital numbers display time (Regular Time/Military Time), indoor temperature( C/F), date, day of week, alarm time with clear and comfortable visual sense. Day of week automatically match with correct date. 2 Alarms for Weekdays or Everyday-- 2 alarms, each can be controlled independently. Also can be set from MON-FRI, MON-SAT, MON-SUN. Beeps start softly then louder, last for 60 seconds. Repeat Snooze Function--When alarm goes off, press top button, beeps temporarily suspends and will sound again 8 minutes later. Smart Night Light--Turn on the senor, sensor light enables clock to automatically give off soft blue light in dark. Energy-saving and user-friendly for a good sleep and better working environment. Alarm Clock Battery Operated--Version improved, extend battery life, can be put wherever you need, also the compact size make it ideal for your purposes of a desk, home and travel alarm clocks. If you have any questions about this product by Peakeep, contact us by completing and submitting the form below. If you are looking for a specif part number, please include it with your message.